"The Winter's Tale" is not your usual Shakespeare fare. It's not a "history" play as royalty populating the story are fiction. It's not a comedy, because there is death. "Tale" is among The Bard's quartet of Romance Plays - neither comedy or tragedy but what today might be termed tragicomedy. The plot of misplaced jealousy and kind forgiveness, of kings and queens, of the mundane and mysticism, makes for a wonderful tale, no matter what the season. Many questions arise pertaining to morals, integrity, and betrayal. One of Shakespeare's most accessible writings, it is a shame that it is not often performed. Shakespeare & Co. has rectified that in this visually beautiful set depicting two countries with characters dressed and coiffed to fit any ancient century. Most interesting is the profound difference between Act I and II - the first, tragic and dramatic; the second, frothy and comic. After intermission, 16 years have passed and with it the characters' lives. Director Kevin Coleman has balanced the two acts as perfectly as a seesaw with strength equal on both sides. Many from the cadre of regulars take lead roles in "Tale," including Jonathan Epstein and Johnny Lee Davenport as the two kings. They are an excellent match, yet Epstein seems a bit affected. Corinna May pours every ounce of fury into her character Paulina, Malcolm Ingram creates a loveable shepherd, Josh Aaron McCabe embodies a moral man asked to do horrible deeds, and Jason Asprey intentionally steals the show as a con man. It is Wolfe Coleman as the young shepherd, a relative newcomer to the troupe, who portrays innocence, sweetness, and stupidity with physical humor to delight his audience. In what is otherwise a nearly perfectly executed production, one suggestion remains - to significantly cut and/or tighten up the long festival scene in Act II. While it adds flavor (literally and figuratively) to the play, the music, dance, singing, picnicking, and even more dance stretches out to enhance little to all that is so powerful and funny in "The Winter's Tale." There are thousands of seats to choose from in front of the Tanglewood shed. Mine was a bit in the sun. As the afternoon progressed so did the shade. The "seats" are actually bring-your-own chairs and blankets, placed anywhere and everywhere on this ever so pristine lawn. On a Sunday afternoon with a temperature of 83 degrees and a shining sun, I was as close to nature as this city "girl" likes to get. The music of the Boston Symphony Orchestra had not yet begun, and that was just fine, as time was needed to first take in the experience of this landscape called Tanglewood. While I did have an assigned seat in the Koussevitzky Music Shed, I immediately chose the outdoor setting instead. I was one of thousands (as mentioned) who enjoyed this open-air amphitheatre. Prime seating seemed to be under the many tall leafy trees. Families, couples, seniors, babies - it was a who's who of people that I didn't know. While watching and listening from my lawn chair (one from the 1960s and not the new fold-ups), I discovered important facts that I was unaware of: sushi can be eaten warm, people still use Red Flyers, women are quicker and more efficient than men at setting up picnics, multi-tasking is a big deal (listen to music, drink a soda, read a novel, participate in conversations), many listeners leave the concert half-way through the final movements (that seems a shame), kids aren't into Frisbees as much as they used to be, men wear Red Sox baseball caps, women wear huge straw hats, and everyone wears sun lotion. This is a colorful place - the newly cut green grass, blue sky with wisps of off-white clouds, tablecloths of flowers, and a sea of motley colored umbrellas. The clang of bells alerted those with seats inside the shed and outside that the concert was set to start. Without fanfare, conductor Christoph Von Dohnanyi led the BSO through two exquisite compositions. My critiques of music are far from expert, which is why this article does not focus on the soft strings, trumpet alerts, and dynamic percussion. As far as this layman is concerned, Beethoven's Violin Concerto in D, Opus 61 featuring Arabella Steinbacher deserved the long standing ovation which it and she received. Following intermission, Dvorak's Symphony No. 8 in G, Opus 88 was musically riveting. Not that anyone would notice, but I was among those lawn listeners who stood and applauded in awe. Was the music really captured in the breezes that surrounded me? Probably not. My place on the lawn became a small expedition, as I walked the entire perimeter to the high bushes setting the division line between Tanglewood and the Berkshire mountains and lake. My secret place (apparently not so secret as others had been on my same course) was the maze of trees, grass, shrubs, and vineyard. Not quite edible yet, blue and green grapes hung disorderly on their vines. I ran into three teens who said to each other that they were lost, but they didn't seem to care. I observed that the longest lines were not to the women's facilities, but to Ben & Jerry's cart. When I arrived, I had asked the gatekeepers, sitting on small stools between the parking lot and the box office, if they were able to hear the concert from their distant location. How sad it would be to sit so close and not appreciate the music. They smiled and answered, "Yes." Apparently, every "seat in the house" at Tanglewood is a great one. Few would argue that "Macbeth" is a play which demonstrates how evil perpetuates, mixes with ambition and envy, and rarely comes to a clean resolution. Macbeth is urged by his wife's undermining his manhood until he consents to take fortune into his own hands. As Macbeth moves to carry out his destiny, the bodies begin to pile up and Macbeth grows literally mad with ambition. The production, which was laden with quasi-Japanese elements, was stylistically flavored with elements of honor and precisely choreographed, war-like movement. The recitation of the text and the movement by the actors were very stiff and, although correct in the rhythm and musicality of the speech, the line delivery suffered because of this. It was almost as if the stylized movement and costuming stilted the flow of the language and acting. Truly, the production value of this show was extraordinarily high. The performances, however, weren't quite up to the par of the visuals. The rigidity of the movement, the costuming, and the line delivery juxtaposed with the primeval stage dressing, left for a muddled show. Few can argue that the defining relationship to highlight is that between Macbeth and his Lady. Unfortunately, there seemed to be no discernable connection between the two characters in this production. While C.J. Wilson (Macbeth) and Keira Naughton (Lady Macbeth) are both clearly gifted actors, the relationship between their characters seemed to lag beyond anything past a superficial connection. As the most striking part of the production, the Three Witches deserve special mention. Their collective performance was quite good, perhaps dangerously so as they sometimes appeared to be in a different show from the rest of the cast. Though more could have been done with their cauldron which was left onstage and unused for the vast majority of the show, it did prove an effective set piece when used. Berkshire Theatre Festival offers a visually beautiful production of "Macbeth," though there was a disappointing lack of connection between design and the execution of theme. While stunning in its precision, the show ultimately fails in connecting all of its elements. It takes something special to stand out as the oddball in a group of circus performers, and "Carnival's" heroine, Lili (Lauren Worsham), has it in spades. Recently arrived from a tiny village in late 1940s France, the penniless and naïve orphan hopes to find work in a traveling circus. Her wide-eyed innocence is met with cynicism and disdain at first, but eventually wins over the jaded performers, and a bitter puppeteer who falls for her. Worsham plays Lili without a hint of irony or self-deprecation, making her naïve to the point of being confounding. 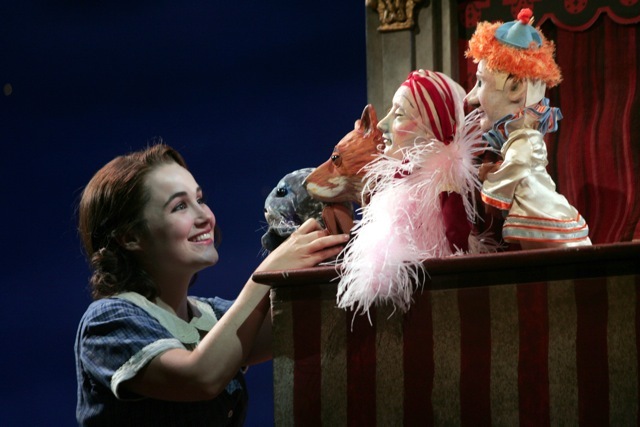 But it's Lily's childlike way and kindness that make the circus puppet show a smash hit and charm Paul, the puppeteer (Adam Monley). Paul is brooding and at times relentlessly cruel, showing kindness only through his puppets, and Monley makes great use of them to express the facets on Paul that can't be revealed otherwise. The ensemble cast makes magic on stage with elaborate displays of acrobatic prowess and serious dance chops. 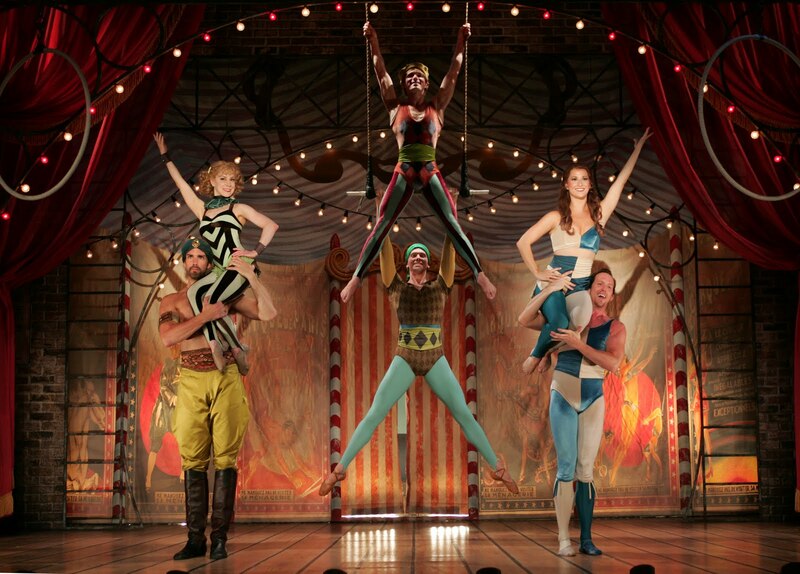 The beautifully detailed set is outfitted with ladders, ropes, and a trapeze, transforming swiftly from a beachside boardwalk to a circus tent. The costumes and set dazzle with bold colors and rich details, and the actors are not outfitted for just a play, but for a show. The lighting is designed to amplify the dizzying mix of colors and movement, recalling the way a circus may seem to a child when seen for the first time. Mike McGowan is sleazy but charming as Marco the Magnificent, the circus headliner and lothario. 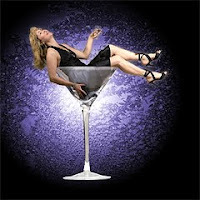 Michelle Blakely is saucy and hilarious as his longtime partner and girlfriend. The ensemble of performers seems to triple in size, creating the illusion of a much larger venue. Goodspeed's presentation of "Carnival!" delivers the awe and delight of a circus. What the show lacks in memorable songs, it makes up for in outstanding song, dance, and acrobatic performances. The well-rehearsed troupe create everything from a carnival funhouse to a Paris nightclub on stage, earning oohs, aahs, and much applause from the enthralled audience. At its best, "Carnival!" transports the audience, using just color, rhythm, and glitter. Concertgoers waited patiently through Jean Sibelius’ short, three movement “Karelia Suite” in anticipation of Maestro Ma. Before he started, he was welcomed with a standing ovation. The beginning “Adagio” was mesmerizingly eerie, robust and beautiful. For the novice listener, “Schindler’s List” magically wove this theme throughout the movie. Ma’s compassion and artistry were all too touching and guest conductor, Charles Dutoit, with a very impressive background, artfully shared his orchestra and Ma equally. In all of Elgar’s 79 years, he only composed music for 20 years, becoming reclusive after the death of his wife. He wrote this masterpiece at the age of 62, and conducted it in 1919. 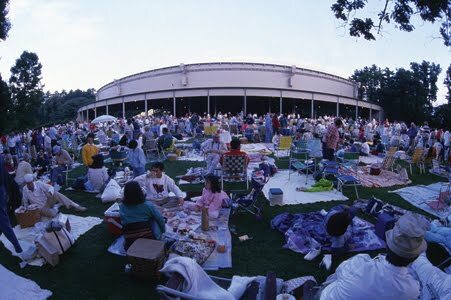 It was first performed at Tanglewood in 1969, by the renowned Jacqueline Du Pre. More tragic is that the illness debilitated her at the young age of 28. Ma made his 1712 Stradivarius empower melancholy. Multi-thousands of listeners listened in silent awe to the man who enabled this beautiful piece of machinery. Short-lived composer Modest Petrovich Mussorgsky was an innovator of Russian music during the romantic period. His desire was to achieve a unique Russian musical identity, and did so in “Pictures at an Exhibition.” These pictures were written hastily, in order to perform as a tribute for his friend, Victor Hartmann. Mussorgsky, who pictured himself rowing through these 12 pictures, painted a complicated story and each had a plethora of information behind them. They are a good read. East Bay soul power from the Oakland area of California powerhoused through a 40+ year repertoire of soul, funk and R&B with their horn centered ten member group. Formed in 1968, the band is absolutely synonymous with world class horns that helped define R&B in the 70's and 80's and continue to play 200 dates around the world every year. Tower of Power started with "We Came To Play" pumped up by the lively horn section of Emilio Castillo on second tenor saxaphone, Stephen ("Doc") Kupka on baritone saxaphone, Tom Politzer on first tenor saxaphone and alto saxaphone, Adolfo Acosta on second trumpet and flugelhorn and Mic Gillette on lead trumpet, flugelhorn and trombone. They swept away the blues with some sweet soul music on "I Like Soul" and "Souled Out" with lead vocalist Larry Braggs' open-throated soulful vocals soaring out front. "Get Your Feet Back On The Ground" featured a saxaphone solo by Emilio Castillo and a smokin' hot electric guitar solo by Jerry Cortez. Frontman Braggs showed off some fancy James Brown style dance moves throughout the night with the horn section soulfully swaying to the beat. This was funky music for a diverse audience. The soul continued -- he was as proficient at the strong delivery of slower soul ballads as he nailed the hit "So Very Hard To Go" and "Me And Mrs. Jones" from their 20th recording from 2009, "The Great American Songbook" which is a collection of old soul songs that influenced their sound. The band flourished on "Maybe It Will Rub Off" and "Got To Groove." Things got really funkifized with a James Brown medley, "Diggin' on James Brown." The hit "What Is Hip?" had people dancing jazzily in their seats and aisles. The group slowed the tempo with the cool energy of their mellow early 70's hit, "You're Still A Young Man." The hot R&B surge spilled over with the loose limbed motion of "Turn Me Loose." They encored with the loud funk of "There Is Only So Much Oil In The Ground." Did I mention this show was funky? George began with the sublime, “Schicksaslied” (Song of Destiny). This work started with orchestra lushness, and the instrumentalists kept it calm and sedate, allowing the audience to enjoy the magnificent harmonies of the score. The chorus was on top of their role – indeed throughout the program-- never stumbling over the language, managing a vocal balance and avoiding shrillness even at the top of the required range. The confidence of their singing speaks well of both the skill they bring to the program and to the ability of their conductor to prepare these 100 adult singers. Orchestral support was solid, with bold solos of flute and oboe and deep resonance from the basses. Both the orchestra and chorus achieved a light effect on the “Liebeslieder Waltzer” but returned to the sublime for “Nänie.” George’s explication of the mythological references was valuable to the audience, and the chorus’ achievement was once again successful in intonation and in ensemble presentation with the orchestra. George added a “Hallelujah Chorus” to the program as a surprise offering, but the real surprise of the evening was the beauty of the contrapuntal writing and the Amen section that closes the short “Geistlicheslied.” Brahms wrote this ten years before completing “Ein deutsches Requiem,” but it foreshadowed many of the fugal effects he used in the later work -- both works were movingly performed. What this evening lacked, in contrast to performances during previous seasons, was a feeling of energy and drive. There was a restraint from the stage that exceeded the respect due these pieces. The chorus was smaller by half than in the other weeks of the Festival, and the audience filled only half the seats. The new facility gives back a dry sound, but this reviewer hopes that future Festival programs will be able to reverberate with more excitement.